Pablo Reinoso's Spiral Thonet is a site-specific installation in the galleries of the Museum of Arts and Design, New York. 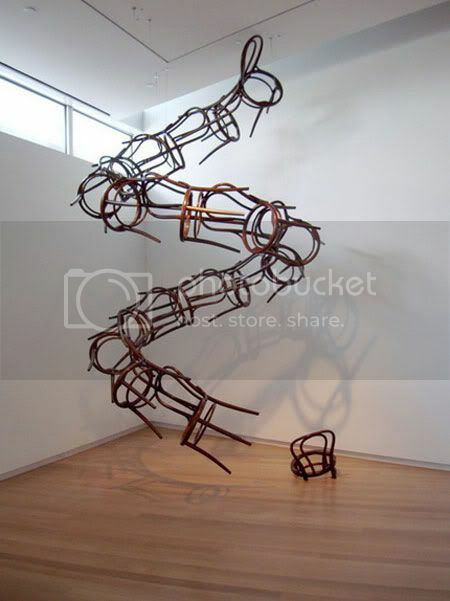 The artist has assembled a succession of Thonet chairs into a helix that stretches from the fourth floor through the gallery ceiling to emerge on the floor above. The Thonet chair is a landmark in repetitive manufacturing; it has been in near-continuous production since the mid-nineteenth century. The technological innovation of bending wood and the affordable, practical, and adaptable form that resulted has made the chair a design icon. While the assembled chairs in this installation are rendered non-functional within the totality of the final structure, they nevertheless suggest an endless genetic design link to their ancestors of a century and a half ago.